Sold all 3 of those ancient Pentium II and III systems I got for free. Some of you I know have older systems lying around... if you have a little time and not using them, why not make some money? 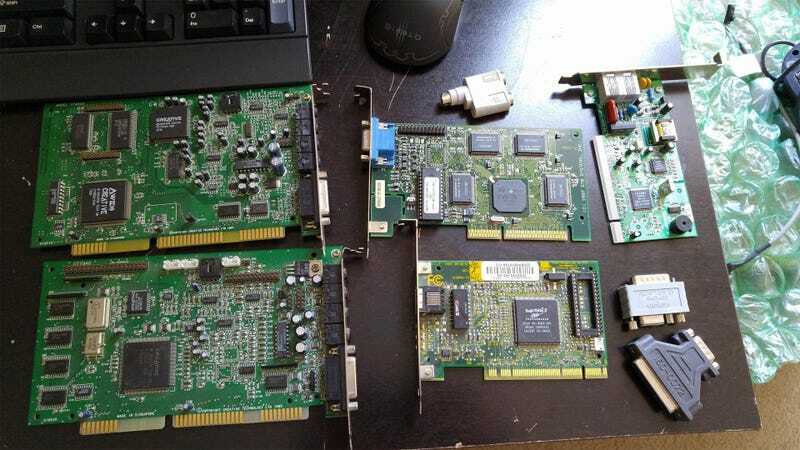 Pictured are the spare parts I ended up with even after ridding those machines - A SoundBlaster AWE64 ISA sound card as well as an SB16, a 4mb AGP STB Velocity (rebranded NVIDIA RIVA 128), some 56K PCI modem, and a 3COM 3C905B-TX network card. Each one I made more than $100 in profit (even after shipping). People go ape if you list “Windows 95/98 Retro Gaming PC” and especially lust after those machines with ISA slots. Don’t believe me? Check this out.